In a community of wonks, it can be hard to stand out, but 14 students have done just that. In a tradition dating back to 1929 and the first University Honors Convocation, AU recognizes outstanding students at the graduate and undergraduate level each year. Like the recipient of this year’s president’s award, these wonks have distinguished themselves with achievements in the classroom as well as in the community. Lauren Barr and Andrey Verendeev have received nods for Outstanding Scholarship at the Graduate Level this year. Verendeev’s psychopharmacology research is the first of its kind to find predictors for opiate use in test subjects, while Barr has compiled a compelling conflict analysis of the situation in post-Arab Spring Morocco. This year’s undergraduate winners are just as impressive. With an extraordinary 3.96 GPA studying outside his native language of German, honors student Robert Helbig majored in international affairs and minored in applied physics. Psychology student Andrew Merluzzi has received over $10,000 in funds to present his research at eight separate conferences across the country. As he leaves AU, he believes the best part of his studies was working alongside minds like Verendeev. “The ability to do research alongside graduate students and faculty, just in terms of working together as a team towards a common goal, was really helpful and will be great experience for the future,” he says. AU also recognizes those students who serve on campus, trying to make the university the best institution it can be. The efforts of this year’s Outstanding Service to the University Community Award recipients are both duly noted and duly awarded. For his service, recent December School of Communication graduate Joseph Corcoran will be honored alongside former Student Government president Sarah McBride. Corcoran, who transferred to AU his sophomore year, advocated for more commuter and transfer student space now found in the library and the East Quad Building – success that has also landed him the Charles W. Van Way Award for building community at AU. McBride’s policies as SG president established open-gender housing on campus as well as a new LGBT studies minor. As much as she gave to the campus, she believes she received more in return. “AU has been so wonderful to me. I’ve gained so much. I’ve learned so much," she says. "I’ve been embraced by friends, administrators, and faculty to such a degree that it was really an honor to be able to serve this community." McBride will also accept the Kinsman-Hurst Award for striving to make the university community as diverse, accepting, and inclusive as possible. 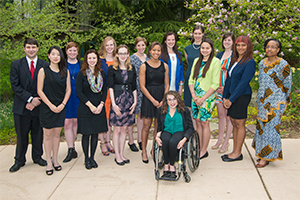 Through its annual Student Achievement Awards, the university celebrates those undergraduate seniors that best represent the diversity of accomplishments possible at AU. Described as one of the most talented soloists ever to graduate from AU, vocalist Carley DeFranco will receive the Evelyn Swarthout Hayes Award for using her gifts to support at-risk youth in DC. While AU has a strong reputation for international and public affairs, DeFranco’s recognition shows the university’s maintained emphasis on the arts. ATV student television general manager Douglas Bell will receive the Bruce Hughes Award for doubling his organization’s membership, where reporters recently secured White House press passes. After establishing the Community Service Coalition, Stephen Bronskill – also selected for the coveted President’s Award – will accept the Stafford H. Cassell Award. Recent December graduate Nazran Baba used his time at AU to create opportunities for cross-cultural dialogue and understanding through roles in International Student Orientation and the Muslim Student Association, making him the first Sri Lankan in 30 years to win the Carlton Savage Award. Abdul Aziz Said Phi Epsilon Pi Scholar for Diversity Daniel Leon was selected for the Fletcher Scholar Award based on his academic achievement and commitment to the community through organizations like the William J. Clinton Foundation. School of Public Affairs Leadership Program student and outgoing Student Government president Emily Yu will receive the Cathryn Seckler-Hudson Award, named for SPA’s first dean. Yu advocated for what became AU’s lowest tuition increase in 40 years alongside a new $1.5 million in financial aid for students. Kogod School of Business student Mercedes Beras-Goico dedicated herself to serving the university community through the 1955 Business Leadership Club before starting the Hispanic Business Association. She will accept the Charles C. Glover Award for combining business leadership and citizenship in service to AU. Like the other student award recipients, Beras-Goico is more than honored for the recognition, but – above all else – she just wants to carry AU with her wherever she goes. Winning this year’s Harold Johnson Award for celebrating Caribbean culture on and off campus, Yanique Campbell has advice for hopeful underclass wonks looking ahead, hoping to stand out as she and her fellow recipients have. Click here to learn more about the University Awards program and the awards ceremony, which will take place Friday, May 10th at 5:30pm in the Abramson Family Recital Hall in the Katzen Arts Center. Visit the 2013 commencement ceremonies website for more information about this year's celebration.